On September 10, 2018, three family dogs got out of their fenced yard on Hamilton Street and ran into the yard of Ward 1 City Councilor Angelina Marino. Within two hours, police had issued the owner a ticket for having a dangerous dog. The owner of the dogs, Becky Spann, alleges that Marino came to her house “reeking of alcohol” and asked for money to pay for her friend’s clothing that Marino claimed were damaged when the dog attacked the friend. Spann says when she refused to pay, Marino called the Geneva Police Department. And now, Spann’s family is facing the possibility of their dog being euthanized by the court. When Spann arrived at the Argyle Street house on the next block, she says she saw her son with the dogs on leashes standing with two adults. “I opened the door to the car and the dogs all jumped in,” says Spann. “I gave the lady the leash and thanked them for helping my son with the dogs and I apologized.” Spann says she then drove away, made a few stops, and arrived home about 45-50 minutes later. Shortly after arriving home, Spann says she answered a knock at her door to find “the lady that helped my son with the dogs.” According to Spann, the woman was “reeking of alcohol” and told Spann that they needed to have a “dialogue” about what had happened. The woman gave Spann a piece of a napkin, and on the napkin was written the items of men’s clothing that had supposedly been torn by the dog, along with the woman’s name and address. At this point, Spann decided that she wanted to talk to the man and “see if he’s okay and what he’s looking for.” Spann admits she was concerned about the man, as Marino gave her the impression that the man had been attacked by her family dog. Marino agreed and the two women went to Marino’s house. According to Spann, “I asked him if he would like me to sew the little hole and he said no, so I said “Well, what do you want?”” Spann says the man answered, “Well, if the dog bit me and I had to go to the hospital, you would have to pay my doctor bills,” to which Spann replied, “You’re right, let’s go to the hospital,” but the man declined. At this point, Spann became frustrated because she felt she wasn’t being told the truth. She also didn’t know that Marino was a city councilor…she simply assumed that one of her neighbors had too much to drink and was trying to scam her. She says she told Marino to call the police. Marino and the man said they didn’t want to call the police, but Spann says she insisted. City Councilor Angelina Marino then called her old friends at the Geneva Police Department. Within a few minutes, the GPD arrived and spoke first with Spann. The police asked Spann if she owned the dogs, and she said yes and told them everything that had happened, including the part of the story when a visibly intoxicated Marino knocked on her door and asked for money for her friend, suddenly claiming that the dog had attacked her friend more than 45 minutes after the dogs had been retrieved from Marino’s yard. Spann’s son also spoke to the police, and told them he chased the dogs to Marino’s yard. The boy said he told Marino and her friend not to try to pick up the tan female puppy, and that the dog did not attack or bite anyone. He also told police that when he tried to leave with the dogs, Marino and her friend told him he wasn’t allowed to leave without an adult, which is why he yelled to his mother to come and pick him up. After the police spoke with Marino and her friend, Patrol Officer Jordan Dobies returned to Spann and told her to wait while he wrote a ticket for the dog. Dobies came back in a few minutes with an appearance ticket to answer the charge of “dangerous dog,” with a court date for Spann two weeks later, on September 24. Spann, not understanding that she would need an attorney, showed up for her September 24 court date and was surprised that she wasn’t allowed to speak. Spann asked the judge if she could tell her side of the story, and he told her she needed a lawyer. Becky’s next court date is set for Wednesday, October 17 at 9:00 am. What Are The Clothes Worth? If we assume, for a moment, that the dog actually damaged Marino’s friend’s clothes, and he wanted fair compensation for those clothes, how much would they be worth? 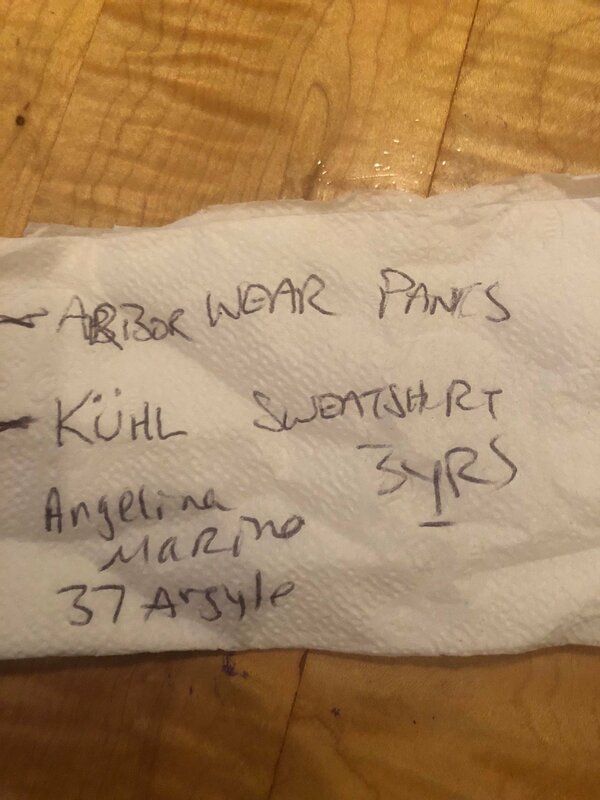 Marino allegedly claimed that her friend bought a Kühl sweatshirt and Arborwear pants three years ago for $200 total. According to the Men’s Clothing Depreciation Calculator at Claims Pages, billed as “a comprehensive online news and reference source for more than 200,000 insurance claims professionals,” we find that men’s shirts depreciate at a rate of 33.3% per year, and men’s pants by 20% per year. The value of any 3-year old shirt, no matter the original cost, is $0.00. The value of 3-year old pants that originally cost $150 is $60. Becky Spann says Marino’s friend asked her for $150 in compensation for damage to his clothes, $90 more than what an insurance company would pay for three-year-old clothes. 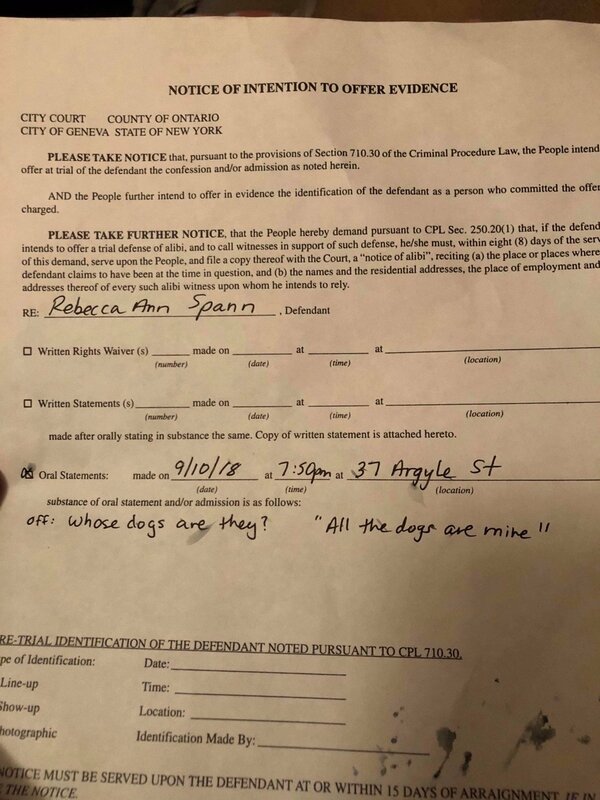 Spann was entirely justified in being concerned that two intoxicated strangers, neither of whom had any injuries, accused her dog of attacking one of them, and then requested a ridiculous amount of money to compensate for supposed damage to their clothes caused by the dog. Becky Spann felt like her neighbors were trying to rip her off. Her dogs had gotten into the neighbor’s yard. Becky retrieved the dogs and the neighbors didn’t mention being attacked. 45 minutes later, one neighbor showed up at her house claiming her friend had been bitten and asked for money. Then, the neighbor who claimed to have been bitten but had no injuries asked for $150 for $60 worth of old clothes. Both of them were visibly intoxicated. Becky needed help so she did what she thought was the right thing. She had the neighbor call the police because she believed that once the police showed up, they would tell her drunk neighbors to go home and leave her alone. What Becky didn’t know was that her neighbor is a city councilor who was the aggressor in three separate domestic violence incidents to which the Geneva Police responded in 2016. 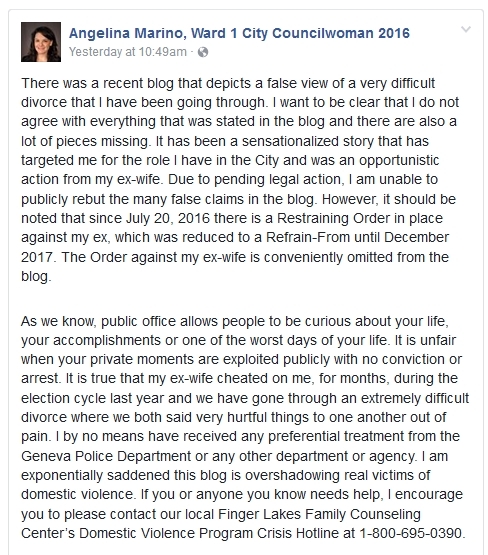 Becky didn’t know this city councilor, Angelina Marino, was heard on an audio recording admitting to multiple crimes and later violated a Refrain from Order of Protection, but the Geneva Police Department never arrested her. The Geneva Police also apparently did not follow proper domestic violence procedure because they never completed or signed any of the three Domestic Incident Reports. Becky didn’t know that Angelina Marino was also heard on an audio recording claiming to have sexual relationships with Geneva Police officers which would protect her from being held accountable, a claim she recanted once the recording went public. WARNING: The following audio link contains graphic language and adult content. Becky called the police because she needed help, and she ended up with her family pet under the threat of being taken away forever. When the story of Angelina’s domestic violence problems were first reported by Geneva Believer in April 2017, many of you came to her defense, which is at least somewhat understandable. Maybe you felt you knew her better than other people, maybe you felt that her repeated domestic violence incidents were being unfairly portrayed, and maybe you felt that publicizing her troubles with alcohol and domestic violence was a violation of her privacy, even though she’s an elected official. Are you surprised that there’s yet another embarrassing Angelina story coming to light? Do you think it’s possible that Angelina, while drunk around 6:00 pm on a Monday night, knocked on the door of her neighbor and asked for money 45 minutes after a dubious “dog attack,” rather than call the police when the “attack” actually occurred? The Geneva Police Department and the Geneva City Council shouldn’t be expected to help Angelina. But her friends should. After everything she went through in 2016 and 2017, did she ever reach out for help for anger issues? For alcohol abuse? Did you help her? Did you offer to help her? Have you seen her unhealthy actions escalate? It’s time for you to stop enabling her and start helping her. If she had been held accountable for her actions a year ago, she wouldn’t have had the nerve to show up drunk at her neighbor’s house asking for money. And now, there’s a family that might lose their beloved dog because of Angelina’s increasingly irrational behavior. Angelina isn’t just hurting herself. 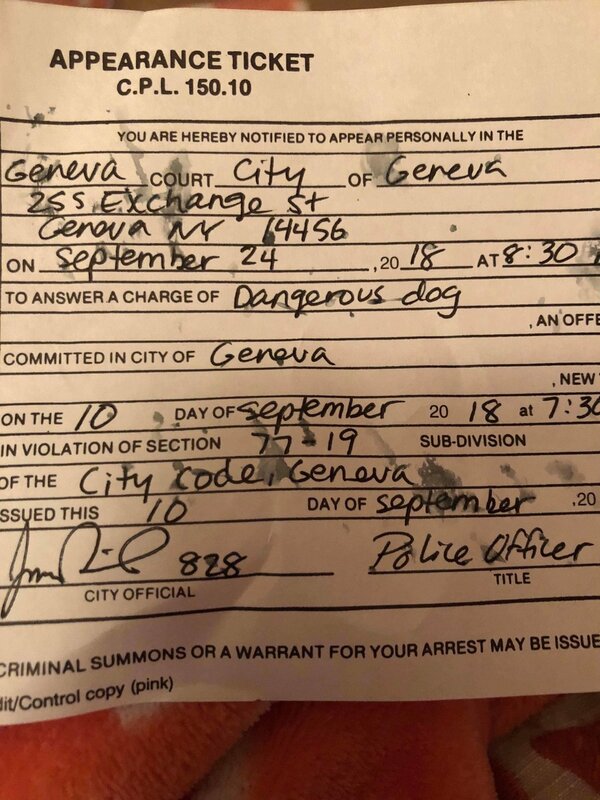 Contact Geneva Police Chief Mike Passalacqua and ask him why his officers decided to take the word of an intoxicated city councilor over the word of a sober Geneva resident and her child, and why the Geneva Police Department seems to be showing a pattern of covering for Marino’s unacceptable behavior. Contact City Council and ask them when they are going pressure Marino to resign due to her history of shameful and damaging actions. Contact Dom Vedora, chair of the City of Geneva Democratic Committee, and ask him when the Democratic Party is going to hold Marino accountable and pressure her to resign. Contact the City of Geneva Board of Ethical Review and report Angelina Marino for violating the City of Geneva Code of Ethics. Contact the Geneva City Court Judges and tell them to drop the charge against Becky Spann and her family pet. Contact City Manager Sage Gerling and ask her why Becky Spann couldn’t get any sort of guidance or advice (other than “get a lawyer”) when she believed she was being treated unfairly by the city’s legal system due to misconduct by a city official. If you can provide any support or assistance to Becky Spann with her case, please contact Geneva Believer as soon as possible. It sounds like Angelina is kinda of a nut case with a drinking problem. She seems to be using her Council set to intimidate her neighbors and the PD, something is fishy about the whole thing.